Retirement News > Pensions > Articles > Lump Sum vs. Pension: Which is the Better Option? You will have to get out a pencil and hand calculator to find the better choice, and it’s dependent on a lot of factors. How is Pension Being Funded? If you select the pension, it may be an annuity bought by your employer’s retirement trust from an insurance company or it may be funded by the trust or even the government on a pay-as-you-go basis. There are risks with any of these sources, and you’ll have to be the judge of that. A pension is inherently a little riskier than the lump sum option because you need to rely on your sponsor to care of your money. The pension may not continue making payments as large as promised if the trust or insurer is weak. Payment failure may be a remote possibility, but it has happened. Further, if you are a government employee, the government may unilaterally elect to reduce the payments—which it can do because it’s a sovereign power. Many retired San Diego city employees saw a 10% cut in their payments this year. Airline pilots have seen much larger reductions because their trusts were under funded and taken over by the Pension Benefit Guarantee Corporation, PBGC. The pilots got hit both with reduced payments because they had to retire before 65 and the maximum the PBGC will pay is far less than they had been promised by their employer. Survivor Benefits: You will want to determine the options for survivor benefits if you have a spouse. The largest monthly benefit will be for no survivor benefit. Of course, this is so hard on the other spouse after your death that the law requires your spouse sign a statement agreeing to this. It’s common to have choices of 0%, 50%, 75% and 100% survivor benefit. The last choice gives the smallest monthly payment. Inflation Adjustments: You don’t say whether the pension will be inflation-adjusted every year. If it is, the adjustments will likely be based on the Consumer’s Price Index, CPI, just like social security. However, very few employers offer plans with such adjustments except parts of the federal and state governments. For example, if you get a military pension, it will have the inflation adjustment. The finance companies usually assume an inflation rate under 4% when they price these, so you would definitely benefit in a high inflation environment such as we had in the sixties. Most pensions from private companies are fixed payments so inflation adjustments aren’t a consideration. Loss of Purchasing Power and Other Downsides for a Fixed Pension: Most pensions and immediate annuities have fixed payments that continue until you or your spouse die. When you take your pension as monthly payments, the payments end when you die. After that point, there is nothing to left for your heirs. This is basically a bet between you and the insurer. You hope you will live longer than the average person, but the insurer knows that more than half the people will die before the insurer runs out of money. The insurer also may have some healthy charges built into the quotes and the only choice you have is to go to a site like www.immediateannuities.com and compare your employer’s quote with those of other sources. 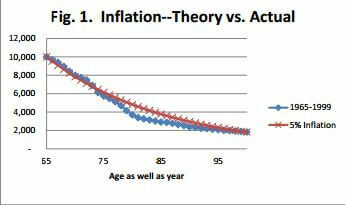 By far, the greatest problem with a fixed pension is the fact that inflation continues to erode its value. My own fixed pension lost 30% of its purchasing power in the first ten years—and that was in a time of relatively low inflation. In a moment, I’ll show you how to make a fair comparison of a fixed pension with inflation-adjusted payments either from a pension or taken as ever increasing withdrawals from the lump sum. Now let’s consider the lump sum. Retain Tax Advantages, If Applicable: If your pension is coming from an employer savings plan, then you want to make sure that you roll the money over into an IRA already established for this purpose. If you get the money in your own hands, you have just bitten off a tax problem that is very hard to digest because you’ve just withdrawn an amount that is fully taxable. A mutual fund will help you with the paperwork to avoid this problem. If you are under 59 ½, you also are subject to a 10% tax penalty. If the lump sum is from a severance package, you will pay income tax, social security and Medicare tax on the proceeds. In this case, you will have to do an after-tax analysis of the comparison using after-tax values of the annuity (pension) payments. However, for the rest of your life, you will also be paying social security and Medicare taxes on each monthly check. Using the Lump Sum to Buy an Annuity: If you take the lump sum from a severance package and then decide to buy an immediate annuity to provide pension payments on your own instead of using the company offer, the calculation is more complex than shown below, so you may want to model this option in the NewRetirement Retirement Planner. Estimate how much income your pension can generate using an Annuity Calculator. Using the Lump Sum as an Investment: If you take the lump sum—and invest it wisely—you can make withdrawals each year that will increase with inflation. In fact, the “Required Minimum Distributions” (RMD) from an IRA or 401(k) increase each year as you age to help counteract inflation. Basically, the RMD is last year’s ending balance of your savings divided by a conservative estimate of your current life-expectancy. I say conservative because the IRS adds several years to life-expectancy so that if you live longer than the average person you will not be trying to run on an empty investment tank. There is an underlying assumption in the IRS rules that your investments will have a return on investment that is at least equal to inflation. You should be able to achieve this with conservative investments like treasury inflation protected securities, TIPS, sold by the federal government or, with a slightly lower return, sold by mutual funds. Good investors who augment their investments with low-cost stock index funds may do better than TIPS, but there is no guarantee. In fact large numbers of investors often have a hard time beating TIPS because they buy securities when their prices have nearly topped out and sell them at lows. Of course, both of these actions are just the opposite of what the perfect investor with perfect foresight would do. Investments Are Risky: One big risk with the lump sum option is that your money is at risk. Whether the funds will last as long as you live is dependent both on the securities markets as well as the amount you take out annually. One very prominent financial expert advised people to invest in 100% stock in a 1999 paper and said that they could withdraw 7.5% the first year and increase the withdrawals by the amount of inflation in all subsequent years—with, he said, very high success probabilities. Well, anyone who retired in 1999 or 2000 and took that advice would be in deep grease today. The remaining investments would be far too small to support many additional years of retirement. All because the stock market plummeted after 2000 and now, six years after very large draws, would take impossibly high returns to recover. You Might Use the Money on Unexpected Expenses: If you have access to the lump sum, you might end up spending it much faster than you intended. If you are planning on taking the lump sum, you might consider putting some of the money into a reserve account to be used on emergencies rather than planning on systematic withdrawals from the entire amount. Do You Have Other Savings? If you don’t have any savings outside of the retirement account, you may want to pick the lump sum option because you’ll have years with unexpected events that will need cash in excess of the annual payments. The pension has no fall-back position. So how do you compare a fixed pension with a payment that is inflation adjusted? Below is a run down of the numbers. You can do this with paper and pencil, or use the NewRetirement Retirement Planner. This award winning system will do all the math for you and make it easy to go back and forth between different options. This award winning system is one of the only online retirement calculators to let you enter pension information of any kind and it gives you a lot of different options. 1. How Much Could You Withdraw Annually from an Invested Lump Sum Pension? The first number you’ll need is the amount you can draw from your investments. You’ll need to estimate the number of years you have till death, namely your life-expectancy. You can use the IRS tables from Publication 590 that you can find on www.IRS.gov. Or, try a life expectancy calculator. Divide the amount in your retirement account by this life-expectancy, and you’ll get the annual amount you can spend from the lump sum. Each year your life expectancy goes down a little, so you in future years you divide by a slightly smaller life-expectancy which increases the size of the next year’s payments and compensates for inflation. 2. How Much Annual Income from the Pension Option? The second number you’ll need is the annual amount from the pension. To make a fair comparison, use the pension quote based on the 100% survivor payment option multiplied by 12 to get an annual amount. 3. Compare the Two Annual Payments: Now compare the two annual payments. If the payment from the lump sum is significantly better than the annual (adjusted) pension, chose the lump sum if you feel you can manage the investments. If the annual (adjusted) pension number is significantly higher than the payment from the lump sum, that may be the better choice. Married couples can gain some risk protection from the pension choice if they choose less than 100% benefit for the survivor. (The analysis above would not be a fair comparison if it was made using less than the 100% survivor benefit.) The risk protection could come from putting away some of the additional payment (compared to the 100% survivor option) into a reserve account if other reserves were inadequate. Nevertheless, if the choice is a fixed pension, retirees should not plan on spending more of the pension than the after-tax amount multiplied by their age at the time divided by 100. The remainder should go into savings to provide for inflation and be drawn down by the cumulative amount saved divided by the current life-expectancy. 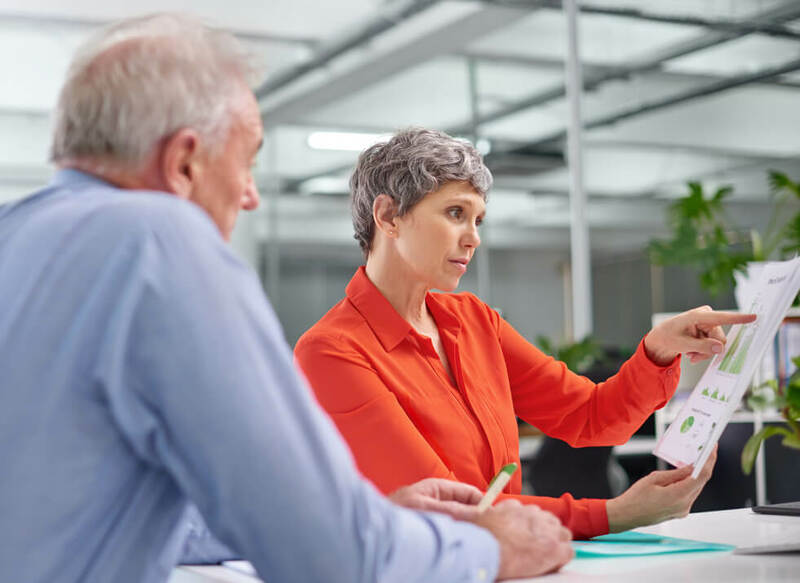 While the math is easy, the risks and considerations aren’t exactly straightforward for making the right pension choices. You and/or your spouse are not in good health, and you do not expect to live very long. You are confident that you can successfully invest the lump sum amount and achieve favorable investment returns over the course of your lifetime. This means that you think you will be able to generate further income that will last the rest of your life. You have enough retirement savings that you do not need the pension to feel financially secure. You are concerned about the financial security of your pension plan because your company may go bankrupt in the future and your pension plan will be underfunded if it does. Before making a final decision, consider your anticipated needs and those of your spouse, the present value of your pension, terms of your pension payments, your tolerance for risk, and your investment experience. If you think that the risks are acceptable for whichever result that the math shows is better, I’d go with the math, but I’d still want some reserves for the unexpected. Keep trying all options as part of your overall retirement plan until you find your path to a secure future. Use the NewRetirement Planner to make this easy.